How did Your Westies Come into Your Life? I don't know. Just a suggestion. I think your son and his friends are putting you on about La La La's name. I read your post separately to both of my sons, and they both had the same reactions. You got Kirby first, and named him because you liked the name. Your son was a teenager at the time. Did he or his friends play Nintendo games? I think he wanted to link the two together. There have been a lot of Kirby games (Mario spin-off), and one of the characters is La La La. If you had a boy I bet he would have suggested Lo Lo Lo. They have been in a lot of the games. My sons recognized it right away. I also looked up the slang, and there are only two la la's, not three. Maybe they did, but something to consider ??? Sorry I'm so late in getting in on this posting! Colette, did you say you live in PA? I checked Petfinder & there's a westie in Chester Springs at a rescue. His name is Barkley and he's adorable! I don't know if that's close to you or not, but sometimes a drive isn't a bad thing. We drove three hours to get our first westie. You are correct in that most rescues won't adopt to homes with children under 10, but exceptions can be made. Usually they interview you & the child to determine that they know how to be around the dog. We have two westies that don't like children so we've taught our grandchildren to not mess with the dog's face and to only pet them on the back and to be gentle. There's always a chance that the dog on petfinder won't be available after you complete the approval process too, that happens a lot in our resuce. If that happens sometimes there's other dogs available and other times they just wait until another comes along. We had had a cocker spaniel when my children were young and four cats. When our first grandchild was born he developed asthma and couldn't be around the animals and since he lived with us that was a major problem. We had to give them all away, which just broke my heart. But we certainly couldn't give the grandchild away! After all of the kids and grandkids were out of the house we talked about getting another dog and by this time my DH had researched his family and discovered he was scottish. We had been to several festivals and saw the westies and scotties and just fell in love with the westies. After researching the breed we decided that was for us! We found Bailey, our first westie, three hours away at an all breed rescue. After being approved we drove to meet him and brought him home with us. We then discovered a local rescue group that we work with now. We failed fostering 101 with them after we adopted the first westie that we fostered. She was a puppy mill breeder that they released and was in horrible shape. You couldn't even tell she was white. She had health problems the whole time that we had her, but she was just a wonderful little dog. Sadly we only had her three years, but they were precious years. DH wanted a puppy the rescue had and so she came, but with another puppy to keep her company. We ended up keeping them both, but the other puppy developed kidney problems and we lost her. The first puppy, Tuffy, was such a bother to the older dogs that we adopted another younger dog to keep her busy. After we lost Gracie Lou, the puppy mill breeder dog, we then adopted another rescue, Kaylee and that completed our four! We love our babies and can't imagine our life without them. that was a wonderful story !!! it was so wonderful how you kept her even after you knew her condition. she would have been put to sleep if you hadn't..... you gave her a great life ! i love how the westies picked you !! they are both so cute. there is no love like westie love !!!! isn't it great to have 2 to keep each other company ??? kirby and la la la have their play time but after her first heat cycle and she learned how to be boss and control him, she don't let him lay anywhere near her. she will growl and take off chasing him down and bite him. she's coming up on 7 years old in may and since she refuses to breed with kirby i told my ds he should go ahead and have her fixed so at least she'll get over her bossiness !! We talked about getting a dog but had no preference on the breed, growing up we'd had a variety of mixed breeds of all shapes and sizes, plus my mum used to foster dogs for the local rescue. We contacted our local RSPCA (this was back in England) and they came by and interviewed my husband and I, and checked our home was suitable and the garden was secure. The following week we went to the shelter to have a look, the last kennel had a westie in it, we decided to take her for a walk and she was very quiet but seemed to like us. We took her back to the kennel and decided we would go home and talk about it, as we were leaving the kennel area a family arrived and said they were here to look at the westie, at which point i turned around and said we would take her! We drove to the pet store and got everything we needed, and they said we could come back and get her the next day, as they would bath and groom her, we couldnt wait and asked to take her that day. Thats how we got Millie, we had her for five years, she was about 6 they think, two days after picking her up we had to take her to the vets to be spayed, i got a call from the vets to say she is fine, but they found three masses. They told us it could be cancer and they would understand if we no longer wanted her, we said of course we want it. She had three tumours removed all of which werent cancerous , whilst doing the op they noticed she had a hernia so called me and asked if it was ok to operate, we said that was fine. All went well and she came home, that evening she was very quiet and we thought it was the anaesthetic wearing off, in the night she was sick so we called the vet, they said to give her some water and some plain chicken and if no improvement in and hour call them back, she ate and drank fine and went to sleep so we went to sleep, the next morning she didnt want to move, so we took her up the vets. Turned out she had a ruptured spleen, not sure how it had happened, they had to do a blood transfusion - luckily yet again she pulled through She was like super dog, she was then fine until the end when she had kidney failure and we had to have her put to sleep. This was one week before my 30th, i decided i didnt want another dog just yet. Then a friend told me that her neighbor had a westie and she had recently had puppies, we went 'just to look' and thats where we found Jess, she came straight up to me and was licking me, so she chose me. Then a year later we decided to get a second dog, husband wanted a pug and i didnt, but i convinced him to come look at some westie puppies, we took along Jess and thats where we got Bluey, him and Jess loved each other from the start, and they sleep together and hate to be apart. living at a farm in the middle of nowhere, we become the dumping ground for people's unwanted animals. we'd feed them, fix them up and find homes for them if they stayed.... but most would just travel on. there was a black and tan dog that got hit by a car i took in, named her Oprah and fell for her. she got well and just moved on with the pack of dogs that barked for her to come back to them. i said i didn't want to go through that again and decided to get the dog i had always wanted...... a westie !!!!! i researched everything i could find on them and collected over 250 pictures just falling more and more in love with them. there was a breeder in livingston that had a boy left from a litter of 7. he was left because he has a curled over tail. we met him and i loved him and he wanted us. i put him down and would walk away and he would follow me so according to all i had read that meant he chose me too!! so i got him for my birthday present. in one of the 250 pictures was one puppy i fell in love with named kirby. i loved the name and it fit him perfectly. he is AKC registered simply as kirby joe. the joe is after my fil and my son joseph. we were so happy and in love with him and 3 months later my son wanted to get a female puppy for his birthday present so kirby would have a mate. we found a litter of 5 females from a breeder in birmingham. we carried kirby with us so he could pick his lifetime mate. . it was the cutest thing watching him choose his mate. there was one that he kept playing with and she kept following him too. so my ds checked her to see if she liked him and wanted him too and she did. she kept kissing him so he knew she was the one. on the way home it was pure love they kissed the whole 50 miles home. then we came inside and she ate out of kirby's bowl and then he didn't like her anymore. he was growly to her all day. that night she woke up and cried and i took her out of her crate and kirby looked at her and did the head side to side thing....... he suddenly realized she was a baby and he was ok with her again and he licked her to make her stop crying. so it was all love again. her AKC registered name is contessa ciara la la la but we just call her la la la. if you do get another westie i hope you take jake and let them pick each other out. it's really fun to watch how they do that. Wow! That's interesting, but that makes PERFECT sense! Thank you for sharing this information. Rescue organizations don't usually ship their dogs. They usually adopt to a very small area because if the dog doesn't work out it can be returned, also they do home visits and check vet references. When we adopted Tucker, we had to bring Shandi with us to make sure they got along. Reputable breeders also won't ship their dogs. We didn't, and we also had a contract that they wouldn't breed the dog unless they showed it first. We also retained co-ownership of the dogs, if they did breed the dog the litter couldn't be registered with the AKC. Once they got the dog fixed, and provided proof from their vet we signed over ownership. This was one way of keeping them out of the puppy mills. I apologize if I seemed to be sounding off. I didn't mean it to sound that way. I too worry about all those puppy mills, but it appears that you are right on the ball on that subject! I'm glad. Maureen gave you some very good advice. I don't know about rescues, but I thought they would ship the dogs. I would think the price of shipping is reasonable. This is a subject that I know nothing about now. Years... years ago I had a Siamese Cat shipped to me from N. Dakota and I recall that it wasn't that much $$ then, but that was then. People get Westies (an other breeds for that matter) without doing their do diligence homework on the breed. Terriers are terrors sometimes, but that is why we love them. Thank God for people like Westigal who rescues our beloved breed and finds good homes for them. Colette, Years ago my husband and I were stationed in England. That is where we got our first westie. When she died I went to Wales to get Abbey. We knew we didn't want a puppy mill dog and I live in Missouri and we are considered the puppy mill capitol of the US. PA is probably a close second. We went to a breeder who also showed dogs and Abbey's father was a champion. We had Abbey shown and she got her championship and then we breed her. We actually drove her to Atlanta to breed her to the stud we wanted to use. The $1000 you mentioned is actually cheap. For an AKC westie that has papers and from a reputable breeder the going rate is now over $2000. And the breeders don't usually make much money. We sold 3 of Abbeys puppies (kept 2), and with the expense of showing, breeding and vet bills we made nothing. The only reason to breed a dog is to improve the breed (according to the AKC) As you can see I am a little passionate about this subject. I guess from seeing all the horror stories about the mills in Missouri. You can go to the west highland terrier club of america and then search for rescue groups. You are right though, they usually don't adopt if you have kids under the age of 10 because of the liability, westies aren't known to be good with kids. There is always the exception, we have a scottie rescue who loves kids, and scotties have a worse reputation than westies. 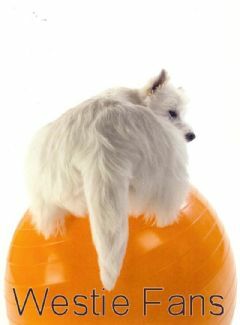 You can also go to www.petfinder.com and search for westies. You might find a pure bred westie or a mix or even a senior (over 7 years old) that they have tested to be good with kids. You know, I tihnk she does. He was a holy terror in his youth, but he has long since settled down into a lovely little companion. Although my little boy was "unplanned", I can't imagine my life without him. fixed -- or broken - LOL! Becky - I don't want to breed the dog (although puppies are cute). We would have the dog fixed (or broken since there wasn't anything wrong with the equipment). Pennsylvania has recently shut down a lot of puppy mills and made more stringent rules. Towards Lancaster, some shelters have rescue dogs from the shut-down businesses. Jake's mama was at the house. The father lived down the road. Jake has papers, but is not AKC. There are other initials, but I would have to get the strongbox down to check what they are. I just wanted a personable, healthy dog. WESTIEGAL lives in Oklahoma, though. That's pretty far from PA.
- CATIATM ( I don't know your real name) - That was a wonderful sacrifice you did for MacDuff. I know he appreciates it. Does your mom regret giving him up now that she can see how good he is? My mother always had standard poodles, but decided Westies were cute and got one from a breeder. She was unprepared for a terrier puppy, and it didn't go well. She was going to take him to a shelter, but I just couldn't bear it. My apartment didn't allow pets, so I had to move an hour further away from work to find a place in my price range that would take pets, andthen he came to live with me. That was 8 years ago. Right off the bat I need to tell you that WESTIGAL works with a Westie Rescue. So there's a good resource if you are looking for a Westie. As for me I went to AKC and looked for a reputable breeder. There weren't many but I found 2 in N. Calif. One in San Francisco and one in Sacramento. I contacted both and found out that the breeder in Sacramento had one male left. She had both the parents which was important for me to see. We went to see the parents and the pups and it was love at first sight. I am VERY leary of pups on the Internet or in pet shops. Puppy Mills have done terrible things to the bread and my own personal opinion they should be avoided. If you are looking for a puppy to breed then especially be careful, and don't breed a dog that has faults. Buddy comes from a line of Champions but has faults so I had him neutered. My family would like to get another dog eventually, but I don't know where she (we would like a female) would come from. When Scoobee died, we visited pet stores. There was a Westie there that was $600 and he was 7 months old. I felt sorry for him; that's an awful long time. He wasn't for us, but that is where we decided on the breed. The animal shelters around here have mostly pit bulls. So I browsed the internet until I found a Mennonite family about 30 miles away that had two females that they were breeding. Jake was one of four puppy brothers. We got first pick. As far as I know, there are no Westie rescues around us. For the few shelters that have small dogs, they don't want small children in the household, and I watch my granddaughters. I wouldn't be approved. The breeders want $1000, so that's out. My sister had pups, so that's how we got Scoobee. Lily came from a pet shop. Becky (cocker spaniel) came from a pet shop. I won Wendy (Sheltie). Scruffy was my husband's brother's dog, and he was allergic. So, my point is .... where did you meet and adopt your babies? Please share your stories.